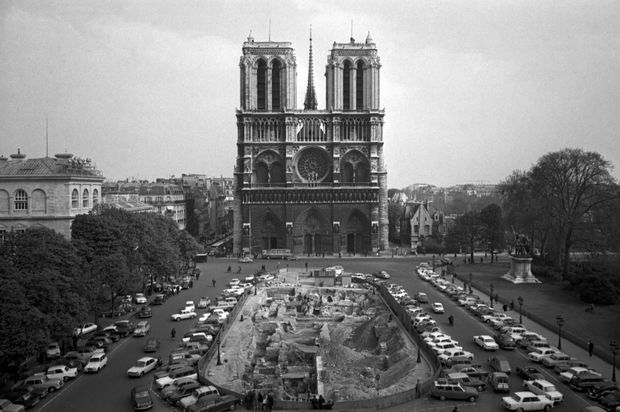 This April 18, 1967, file photo, shows the Notre-Dame Cathedral in Paris. The Cathedral of Notre-Dame, where a large fire broke out Monday evening, is among the most famous landmarks in Paris, drawing about 13 million visitors a year. It was damaged and neglected in the 1790s, during the French Revolution. Victor Hugo’s 1831 novel, Notre-Dame de Paris, published in English as The Hunchback of Notre Dame, informed readers about the building’s decrepit condition. The book helped spur significant overhauls from 1844-64, when architects Jean-Baptiste-Antoine Lassus and Eugène Viollet-le-Duc redid the spire and flying buttresses.